In just 25 years, CQUniversity is emerging as one of Australia’s truly great universities. We have over 20 locations across Australia, including 14 campuses and growing for international students. Our award-winning academic staff and high quality research are making an impact on the communities we serve and those around the globe, whilst our dedicated professional services staff continue to improve the overall experience of all our students. We are proud of our achievements and will continue to build on these prestigious highlights. The ISB is facilitated by i-Graduate and is the global benchmark instrument used to track the international student experience. The Times Higher Education (THE) has ranked CQUniversity in the top two per cent of universities, and for the first time has ranked five of our subject areas. The subject rankings used the same performance indicators as the overall World University Rankings, but the methodology differed to suit the individual fields. CQUniversity ranked in the top 400 universities for Business and Economics subjects. The ranking included 585 universities and highlighted universities that are leading across business and management, accounting and finance, and econometrics subjects. Making the top 400 reaffirms the popularity and value of the University’s business and business-related courses, some of which come with unique internship opportunities developed specifically to provide international students with relevant work experience during their studies and maximise their workforce readiness. A top 400 ranking in Education, which assessed leading universities across education, teacher training and academic studies in education subjects. A top 500 ranking in Social Sciences, which assessed leading universities across sociology, geography, politics and international studies, and communication and media studies subjects. A top 500 ranking in Life Sciences, which assessed leading universities across agriculture and forestry, biological sciences, veterinary science and sport science subjects. A top 600 ranking in Pre-clinical, Clinical and Health, which assessed leading universities across medicine, dentistry and other health subjects. The Good Universities Guide recently released its 2019 star ratings, which show CQUniversity has achieved five stars in a number of categories including overall experience, teaching quality, graduate employment and starting salary. These ratings put the University in the top 20% of universities nationally. Below is a summary of CQUni’s achievements in graduate outcomes and educational experience, broken down by areas of study available to international students. The below table highlights various educational experience measures by areas of study, where the University is among the top 20% nationally, with a few measures see us achieving the highest rating in the country. The Good Universities Guide star ratings are conducted by the Good Education Group, one of Australia’s leading providers of high quality education and career information to prospective students. In the latest QS Stars rating system, CQUniversity has achieved overall four stars, and five stars in three important categories: Employability, Internationalisation and Teaching. Employability measures the success of graduates in finding jobs and the University in helping them. CQUniversity’s career services are some of the best in a university setting, with regular career support workshops and other careers focused services including CQUni Career Connection, CQUni Careers and CareerHub to help prospective and current students and graduates of the University in their job searching and career development. Internationalisation shows how international a university is, and with a five star rating, CQUniversity is recognised by its global outlook and diversity. The University has world-class global mobility programs, overseas placements, international partnerships, and is the preferred education destination for students from over 115 countries. To provide a platform for students to connect with us more easily, we also have three physical offices offshore in China, India and Singapore. Teaching looks at the faculty-to-student and teacher-to-student ratio and the levels of student satisfaction with teaching. With small class sizes, teachers are able to spend more time individually with students. Whilst small classes do not entirely represent quality teaching, this rating indicates our commitment to teaching, which correlates with the high quality teaching provided at the University. QS Stars is a rating system that assesses how universities perform against a comprehensive list of indicators, to ultimately help students select the right university based on their interests. For more information on how CQUniversity performed in this system, visit the QS Stars website. CQUniversity joins a number of Australian universities in the QS top 100 under 50 list as one of the world’s leading universities under 50 years old. Recognised for academic and research excellence, industry engagement and international outlook, CQUniversity is solidified by this ranking as a young and innovative university, enabling like-minded, success-oriented individuals to connect and learn from the best. Find out more on the QS website. The 2018 Quality Indicators for Learning and Teaching (QILT) results show CQUniversity's focus and commitment to improving the overall student experience is paying off. These results are a true testament to the student-focused approach of our innovative, dedicated and hard-working academic and professional staff community at the University. Undergraduate overall employment rating of 90.4% compared with the national average of 87.5%. Undergraduate median salary of $62 600 compared with the national average of $58 000. Postgraduate coursework median salary of $95 000 compared with the national average of $80 000. Postgraduate coursework full-time employment rating of 88.4% compared with the national average of 84.7%. QILT is run by the Federal Government and provides transparent information about all of Australia's higher education institutions, from the perspective of recent students and graduates. Read more on these achievements on the CQUniversity website and the QILT website. CQUniversity Australia has once again been named among the top two per cent of universities in the world, claiming a spot on the Top 600 list of the prestigious and well-respected Times Higher Education World University Rankings 2019. Founded in 2004, these rankings provide a definitive list of the world's best universities, evaluated across teaching, research, international outlook, reputation and more. With more than 26 000 universities across the globe, this result places CQUniversity among the top two per cent of universities worldwide. Along with this, Times Higher Education also recognises CQUniversity as one of the world’s best young universities, placing it in the top 150 institutions under 50 years of age (2018). The new ranking reflects our commitment to research, learning and teaching, international outlook as well as providing the best student experience. CQUniversity's commitment to engagement and social outreach has led to CQUniversity being recognised as Australia's first and only Changemaker Campus by Ashoka U, an exclusive global social innovation group, made up of only 30 other high profile education institutions across the world. All member institutions collaborate with each other to break down barriers to institutional change and foster a campus-wide culture of social innovation. The Excellence in Research for Australia (ERA) 2018 results show CQUniversity is conducting research rated as at, above, and well above world standard across 22 various research categories. The ERA initiative is developed and managed by the Australian Research Council (ARC) as a major funder of public sector research. It assesses research quality within Australia's higher education institutions using a combination of indicators and expert review by committees comprising experienced and internationally recognised experts. The remarkable 2018 results build on CQUniversity’s previous success, achieving research ranked as at, above and well above world standard in 14 different research categories in 2015. The ongoing success demonstrates CQUniversity as a leader in translational and impactful research that has direct benefits for industry, community and stakeholders, creating a rewarding research experience. For more information and to read the full report, visit the Australian Research Council website. Learn more about CQUniversity’s Research. CQUniversity has been rated within the Top 10 of all MBAs across Australia. Among approximately 50 MBA providers our program voted into 9th position by the BOSS Magazine's MBA Ranking. 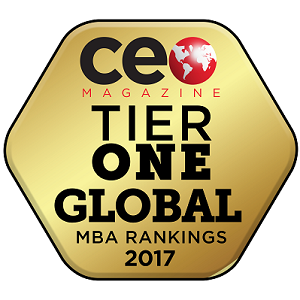 CQUniversity’s MBA has been further cemented as one of the best in the world after being placed in Tier 1 of CEO Magazine’s global MBA rankings. These rankings are designed with applicants in mind and are based upon key performance indicators that are of interest and value to students including: including quality of faculty, international diversity, class size, accreditation, faculty to student ratio, price, international exposure, work experience, professional development, gender parity and delivery methods. CQUniversity’s CQUEnglish took part in the 2017-2018 English Language Teaching (ELT) Barometer, and gained an overall ranking of 10 within a group of 32 English language centres throughout Australia. A pleasant highlight for CQUEnglish is a first place ranking for making students feel welcome. This perfectly aligns with the wider university’s focus and commitment to provide the best student experience for all our students. For overall learning, living, support and arrival, CQUEnglish students scored their overall experience highly, resulting in a significant improvement in overall rankings for these measures compared to the previous barometer conducted in 2016.